Were Pakistan’s flags used on Kolkata’s roads ? This #FakeNews creator’s fascination for Pakistani Flag has been going on for years. Few have been debunked in last few years, listed below. 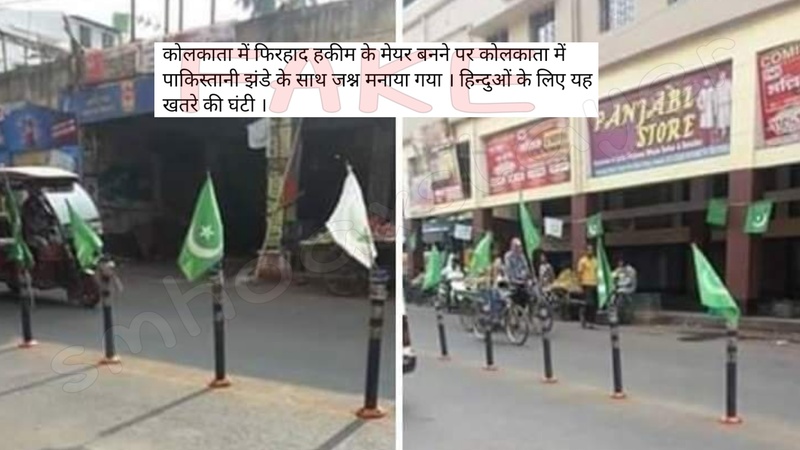 Two photos are viral claiming to have Pakistan’s flag decorated on Kolkata’s roads after Firhad Hakim became Mayor of the city. Facebook post below by Dilip Singh by now has approx 1000 shares. Pakistan flag waved in Kolkata under CM Mamta Banerjee ? Did Gurmeet’s Supporters wave Pakistani Flag in Rohatk today ? Neither this is Pakistani flag, nor is this celebration of Pakistan’s Win. A TV channel calls a religious flag as country’s. ← For PM’s Jodhpur Rally, wrong photos are viral. Did China execute 26 corrupt politicians publicly ? June 16, 2018 Hoax Slayer Comments Off on Did China execute 26 corrupt politicians publicly ?